The view from Bok Bar. Bok Bar, the rooftop beer garden with Instagram-worthy views, has announced it will officially open for the 2018 season on Thursday, May 24. It's over a month away, which might feel like an eternity, but the building is hosting a special event to help fans of the space make it through the wait. 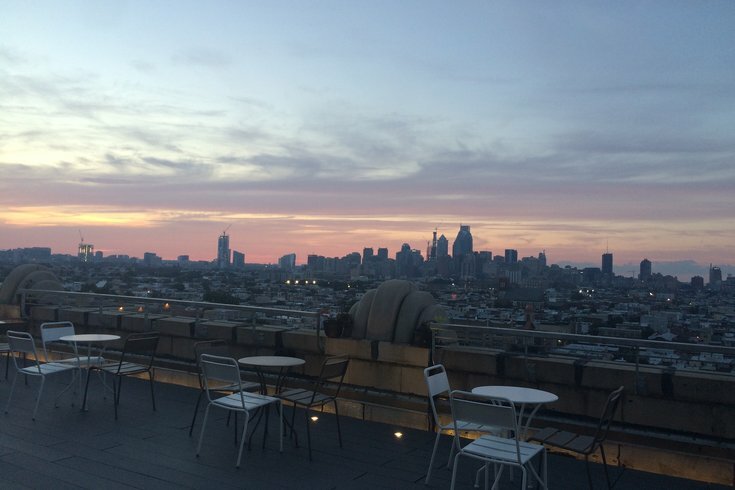 On Saturday, April 28, there will be a dinner party at Bok with South Philly Smokhaus. It won't be held on the roof, but instead will take place on the 8th floor terrace. Don't worry, the vantage point also offers stunning sunset views. This spring, a new cocktail lounge called Irwin’s will open there, offering another place to drink inside Bok. The dinner party will begin at 6 p.m. and tickets to join are $35 per person. Included is a family-style barbecue dinner and two drinks from the bar. Adults can choose among beers, wines and ciders. For those under 21, there will be soda. To eat, there will be pulled pork, brisket, chicken wings and Texas hot-links sausage, along with deviled eggs, potato salad, coleslaw and corn bread. For dessert, there will be short cake topped with berries and whipped cream. Attendees are invited to stick around after dinner to enjoy the space and can order drinks from the cash bar.